Directed by Patricio Guzman, The Battle of Chile Pt. 1: The Insurrection of the Bourgeoisie is the first part of a trilogy of documentary films chronicling the events that led to a military coup d’etat led by Augusto Pinochet to overthrow President Salvador Allende on September 11, 1973. Shot during a period of turmoil in early 1973 following a congressional election to the events that led to the coup d’etat as it‘s narrated by Abilio Fernandez. The result is a chilling and evocative film from Patricio Guzman. Shot from March of 1973 during a congressional election to the attempted coup d‘etat in June of that year, the film follow the events that lead to the military coup d’etat by Augusto Pinochet who would overthrow President Salvador Allende who would kill himself during the coup. Told in several chapters, the film follows all of the sides that lead to a very catastrophic event in Chile that shows a country severely divided. It begins with the congressional election in which the left-wing Unidad Popular (Popular Unity) party overwhelmingly defeated the more conservative Confederation of Democracy party. The film interview many ordinary people who support the UP or CODE as it display this divide socially and politically among the people as UP tends to favor the working class, the poor, and Socialists while CODE is supported more towards the middle and upper class. With the aid of cinematographer Jorge Muller Silva (whom the film is dedicated to) as well as several cameramen, Patricio Guzman goes inside into the events that led to this coup as he’s in the middle of protest marches or filming it from afar. With Abilo Fernandez narrating these events that include student marches, a miner’s strike over copper when Pinochet decided to nationalize the copper mines for its people, and attempts by the country’s congress led by its right-wing opposition would showcase these things that tried to crackdown on Allende’s rule. 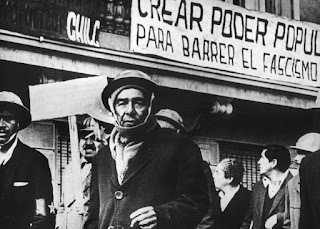 Much of the camerawork in the film with hand-held cameras as it is all shot in grainy black-and-white film stock where Guzman would shoot many of these events as it play into this political and social divide in Chile. With the help of editor Pedro Chaskel and the sound work of Bernardo Menz, Guzman would showcase these moments that are quite intense as well as violence in the streets. The film would end with the early moments of the June coup d’etat as it shows some shocking footage that lead to a sign of what is to come. Even as Guzman and narrator Abilo Fernandez would talk about the U.S. involvement with the coup later that September as some of the conservative officials and managers were trained by the CIA. The Battle of Chile Pt. 1: The Insurrection of the Bourgeoisie is a tremendous film from Patricio Guzman. It’s a harrowing documentary that explores one of the darkest chapters in world history captured by a film crew that sees everything unfolding just as it’s happening. In the end, The Battle of Chile Pt. 1: The Insurrection of the Bourgeoisie is a phenomenal film from Patricio Guzman. I'm kind of embarrassed to admit I don't know this at all.